Serves as a sustainable income stream. Much like any other aspect of independent music marketing, growing a Spotify following is a long-term strategy and not a ‘get famous quick’ scheme. 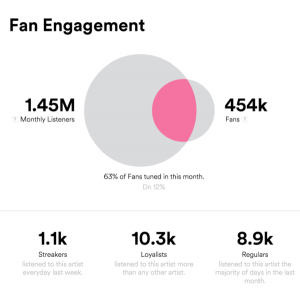 However, most artists can expect to see a significant increase in their Spotify streams, income and fanbase after six to twelve months of actively growing their Spotify following. In order to get your material on Spotify, you’ll have to go through an official online distributor. This is a third party company that processes and submits your music to online stores, whilst also collecting and delivering your royalties. The most affordable and artist-friendly distributor I’ve found is Distrokid. Distrokid allows artists to submit an unlimited amount of music to over 150 online stores for just $19.99 per year (many other distributors charge several times that for a single album). They also allow you to keep 100% of your royalties and offer you the option of splitting your payments. You can receive a 7% discount on your first year of distribution by following this discount code. Once submitted, your music should be live on Spotify within 10 days. Make sure you’re releasing the best music you possibly can: An obvious one, but releasing fantastic music will maximize listener engagement and entice them to click on your artist page. Choose a high resolution artist picture that effectively communicates your visual identity: Music consumers seek out bands and artists who share a similar set of values, ethics and personality traits to themselves. As your artist picture is one of the first things that potential fans will see, it’s important to ensure that people can easily connect with you through your image and branding. Ensure you have a concise, well-written artist biography: Much like your artist picture, your biography is a fantastic chance to sell yourself to both audience & industry by highlighting your personality and values through both the content and writing style. For more information on how to write an effective artist biography, check out our dedicated article on the subject. Create & highlight custom playlists: Custom playlists give fans an insight into what sort of music you’re listening to and who you’re influenced by. This adds a personal touch to your profile and simultaneously allows you to connect with other artists & content creators. Make use of ‘Artist’s Pick’: ‘Artist’s Pick’ is a feature that allows artists to highlight a particular release on their profile for 14 days, much like a pinned social media post works. This can be updated regularly to highlight playlists you’re featured on, new releases or other content you’re enjoying. Add your tour/gig dates: This ensures potential fans you’re active and organized, whilst also quickly presenting them with opportunities to see you live. Link to your social media channels, placing high-engagement platforms first: If your music, artist image and biography is well-optimized, you’ll undoubtedly see traffic being driven to your social media channels via your Spotify page. It’s vital you drive traffic to platforms that offer high levels of engagement (such as Instagram). This’ll allow you to easily curate a relationship with fans who find you through Spotify, which can later be monetized. It’s vital to keep your artist page up to date. This includes your tour dates, biography and artist pick. This communicates that you’re an engaged and active band whilst providing returning fans with new content on a regular basis. This data should be monitored regularly and incorporated into your advertising and promotional efforts. Link to your Spotify page on all relevant social media posts & platforms: Insert the link to your Spotify page in the ‘bio’ section of all your social media channels and add a Spotify CTA (call to action) in all relevant posts. Add the Spotify ‘follow’ button to your website: This makes it incredibly easy for fans to follow you on Spotify and helps drive your website traffic to your Spotify page. Run giveaways to help promote your Spotify page: Run a giveaway where fans enter by either following you on Spotify or adding you to a playlist (or both!). This is an effective way to build up your Spotify followers, enabling you to get blue tick verified and playlisted. Playlists truly serve as the heart and soul of the Spotify platform. Additionally, I’d argue that they are by far the most important aspect of growing your Spotify following. Artist-Generated Playlists: Curated and promoted by independent bands and artists. Fan-Generated Playlists: Curated by music consumers, most often for personal use. Collaborative Playlists: Playlists that can be followed and curated by multiple users. Influencer Playlists: Curated and promoted by leading influencers in the industry (such as blogs or record labels). Editorial Playlists: Manually curated by Spotify’s in-house editorial team. Post-Show Playlist: Playlist curated after a show consisting of your own setlist as well as the setlists of the other bands/artists on the lineup. This not only serves as an effective follow-up for those who attended the show, but also helps strengthen and consolidate your relationships with the other artists who played. The other artists will most likely want to share the playlist on their own social media channels, which attracts new listeners to your material. Influences Playlist: A playlist comprised of your biggest musical influences, with some of your own tracks thrown in. This not only adds a personal touch to your Spotify page, but also helps trigger the algorithm for Spotify’s personalized playlists. Unsigned Scene *Your City* Playlist: Playlist comprised of bands and artists who are active in your local unsigned scene. Once again, this strengthens your reputation within your local scene and also allows you to tap into the fanbases of other local acts. Unsigned *Your Genre* Playlist: This brings similar benefits to the previous suggestion, but allows you to promote on a national or even global basis. Ultimate *Your Project* Playlist: A playlist consisting solely of your own music that can be promoted to your existing fan base. Encourage others to follow and share your playlists: Encourage your existing fan base, friends, family and fellow featured artists to follow the playlist and share on their social media. This helps attract a wider audience to your playlists and also builds your credibility with Spotify. This vastly increases your chances of being featured on Spotify’s personalised playlists. Create custom artwork: Having appealing, professional-looking artwork might seem small, but it significantly helps your playlist stand out and look credible. I’d recommend modelling your artwork off of Spotify’s artwork for their editorial playlists as this is an artwork design that music consumers already associate with professionalism and credibility. Check out Indie Panda’s weekly unsigned playlist for an example of such artwork. 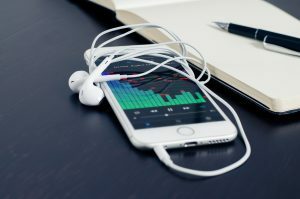 Create new playlists and update your existing ones on a consistent basis: Not only does this allow you to constantly provide your fanbase with new content, but it also continues to strengthen your relationships with other independent artists and tap into as many other existing fanbases as possible. It also continues to provide data for Spotify’s algorithmic playlists. Get in the habit of encouraging your fans, friends and family to add you to a playlist: After you’ve established Spotify as the primary platform to listen to your music on, start to encourage others to add you to their playlists. Take an active interest in what else they’re listening to and initiate discussions online regarding fans’ music tastes. Run giveaways: Run a merch/ticket giveaway where your audience can enter by following you on Spotify and adding you to a playlist. This is a hugely effective way to get your music added to a significant number of playlists for next to nothing. Offer to make playlists for others: Encourage your audience to send you their music tastes, which you’ll use to make a custom playlist. This also has the added benefit of strengthening your relationships with existing fans. Share the playlist on your own social media: This holds the primary benefit of strengthening your reputation within the independent scene. If influencers see you are active on the platform and consistently supporting the work of others, they’ll be far more likely to add you to their own playlists. Use the playlist as a means of interacting with other featured artists: It’s important to connect with other independent artists on a regular basis to strengthen your reputation and leverage your connections. Discover Weekly: Weekly playlist (released every Monday) Comprised of new artists based on a user’s listening history and other user’s playlists. Release Radar: Weekly playlist (released every Monday) featuring newly-released songs from artists that a user has shown interest in on Spotify. Make sure you are releasing the best music possible on a consistent basis: Having good music will maximize listener engagement for obvious reasons. In addition, Spotify algorithms collect data on how users interact with a song (skipping, listening all the way through etc.) in order to allocate songs to algorithmic playlists. Therefore, it’s in your best interest to ensure as many users as possible are listening to your songs all the way through. Releasing high quality music on a consistent basis maximizes your chances for regular Release Radar placements. Put the groundwork in first: As personalized algorithmic playlists are based on data from other users, it’s vital to focus on both artist and fan-generated playlists on a consistent basis. This’ll maximize your chances of getting featured on a personalized algorithmic playlist. Encourage others to follow you on Spotify: Release Radar playlists are primarily comprised of new releases from artists that each individual user follows. Therefore, the more followers you have, the more Release Radar playlists you become eligible for. Put the groundwork in first: Notice a running theme here? Ensure you are consistently working on your own playlists as well as promoting and encouraging both collaborative and fan-generated playlists. This shows the influencer that you’re active on the platform and actively engaging with both audience & industry. Remember that influencers rely on artists to grow their own brand and therefore seek out hard-working and credible acts who are actively promoting the work of others with an engaged audience. Take an active interest in the influencer: Become active on their social media platforms and begin sharing their work before you make a submission. This sets you apart from the thousands of other artists who submit blindly and makes the influencer much more likely to return the favour when you eventually make a submission. Ensure you are submitting to a suitable & relevant influencer: Whilst this sounds obvious, you’d be amazed at how many bands and artists blindly submit to playlists that they’re completely unsuitable for. If you’re a death metal band, don’t try and submit material to a hip hop influencer. Follow this guide: Being active on the platform, building a strong following and having your music on a large number of playlists will help bring your attention to Spotify’s editorial team. Have good industry connections: ‘It’s not what you know, it’s who you know’ certainly applies here. If you are not making an effort to network within the industry on a regular basis, you are doing both yourself and your project a severe disservice. Networking on a regular basis builds your reputation as an independent artist and leverages your chances of meeting a good connection, such as someone involved with Spotify’s editorial team. Submit to Spotify directly: Artists can submit unreleased material to Spotify editorial playlists directly through their ‘Spotify for Artists’ account. However, this has a notoriously-low success rate and I’d strongly encourage simply putting the groundwork in yourself. Streams: Having a significant number of streams can generate a sustainable income. For example, 250K monthly streams translates to roughly $1000 (USD) in revenue. Fan Conversion: This is an income stream with huge potential that no one seems to be talking about. Additionally, it’s much easier to achieve than the previous income stream. If your Spotify page is well-optimized and you’re following my playlisting guidelines, you stand a high chance of turning Spotify users into fully-fledged fans each and every week. These relationships can then be monetized long-term with merch, ticket sales etc. 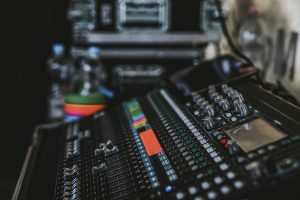 Ensure your music is the best it can be: This is the third time I’ve mentioned this in this article, and for a good reason. When it comes to Spotify playlists, your music serves as the sole introduction to your project. It has to be good enough to stand out from the competition and entice users enough to click on your artist page. Ensure your artist page is well-optimized: Having a solid artist image, biography and artist pick will entice users to check out your social media channels, which should be clearly-linked on your artist page. This is absolutely vital when it comes to converting chance listeners into fully-fledged fans. Push playlisting consistently: This helps to build up your streams on a steady, yet consistent basis. This is a marathon, not a sprint: Growing a large Spotify following and obtaining a sustainable income from the platform will not happen overnight and there is no ‘magic bullet’. It takes time, dedication and hard work. Think of Spotify as a social platform, not a streaming service: Spotify is very much a social platform and should be treated as such. Your artist page and playlists should have an inclusive and personal feel to them. Reflect & Review Constantly: As with any other independent music campaign, it’s important to regularly reflect & review what’s working and what isn’t. Spotify for Artists does a fantastic job of providing rich analytics that can be used to your advantage whilst growing a Spotify following.